Thank you for donating to the Jewish Jewels outreaches in Israel. Neil and Jamie see Psalm 102:13 as an end-time rallying call for the people of God to stand with Israel and the Jewish people: "You will arise and have mercy on Zion; For the time to favor her, Yes, the set time, has come." 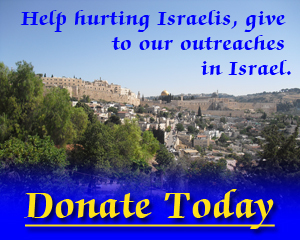 Help us donate much needed funds to outreaches throughout the land of Israel. Having been on the Mercy Mission numerous times I have personally been apart of blessing the lives of the Israeli people with love and hope. Some of the Mercy Missions have been visiting the Organization of Victims of Terror, baby showers at Bnai Zion Hospital in Haifa, visiting childrens' homes in Netanya, sponsoring an orphan bride's wedding, and visiting army bases to bless the IDF soldiers. (One year we gave all the soldiers Psalm 91 bandanas in Hebrew.) The blessings the group brings to the land can’t be compared to any other experience. Following the leading of the Holy Spirit in giving the Love Baskets (food coupons) to ones in need is a blessing you can’t imagine. The added bonus of meeting the people, interacting with them on a personal level broadens your understanding of the Biblical land of Israel. It’s about bonding together as a group to pray for the people and prepare for the Mercy Missions. It’s the Jewish Jewels way of showing GOD’s heart for the people and land of Israel.